Incredibly fast and easy to use! Meguiar's Rinse Free Express Wash & Wax is a specially formulated product that allows you to wash and wax your car in one easy step. 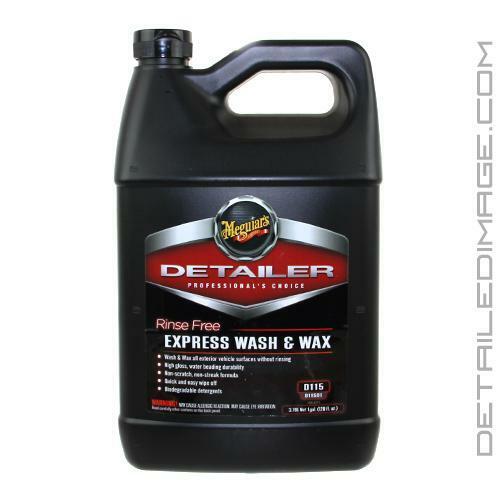 This product will allow you to not only safely remove contamination from your paint, but also add a layer of substantial carnauba wax protection without ever having to rinse down your paint afterward! Simply dilute this product anywhere from 4:1 to 8:1 and spray the product onto your paint one section at a time. Dry the surface with your favorite microfiber towel, flip the microfiber towel and lightly wipe to achieve that deep gloss shine! This is the perfect way to help minimize water consumption, especially in areas that have water regulations or you simply do not have access to a hose (i.e. apartment complex, garage, while traveling, winter washing, etc.). This product also works great when using the traditional two bucket method of washing. You can be proud that this formula is environmentally safe and biodegradable. Grab yourself a bottle of the Meguiar's Rinse Free Express Wash & Wax and clean and protect your paint, without having to rinse with water! Meguiar's Rinse Free Express Wash & Wax is formulated to be used as an alternative to traditional washing on light to moderate dirty vehicles. Can be applied with traditional trigger sprayers or low pressure tank sprayers. Clean and protects, without rinsing with water! DIRECTIONS: SHAKE WELL. For best results, apply to a surface that is cool to the touch. Mix up to 4:1 ratio with clean water in a trigger sprayer or low pressure tank sprayer. Spray product on surface one section at a time. Work from top to bottom of the vehicle. Dry the section by using a clean dry Ultimate Wipe (M9910). Immediately turn the towel to dry surface and lightly wipe to a deep gloss shine. Repeat steps 2 - 3 above for each section of the vehicle.